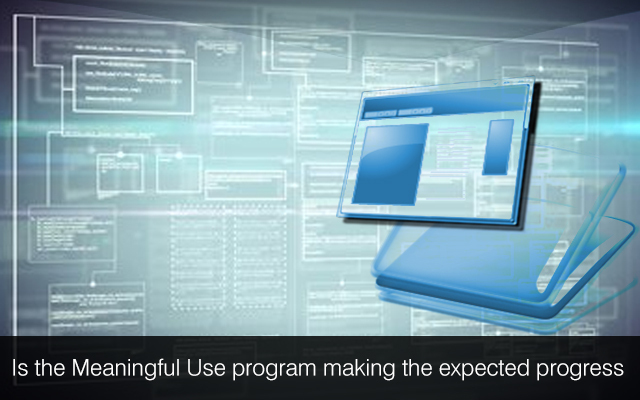 Is the Meaningful Use program making the expected progress? The Medicare and Medicaid EHR or Electronic Health Care Record Program is designed to provide a variety of incentive payments that are meant for eligible professionals, hospitals, as well as various Critical Access Clinics or Hospitals. These programs adopt, upgrade, implement as well as demonstrate various meaningful use of the certified EHR technology. More categorically speaking, Meaningful Use (MU) can be defined as a set of conditions or criteria that are used in the EHR systems for improving the quality of patient care services that are offered by the clinics, hospitals as well as other healthcare providers. This concept was for the first time developed by NQF or the National Quality Forum. The ideas that are included within Meaningful Use include incorporation of improved health for the population, a proper coordination of care, improved health care safety or security, proper as well as safe patient engagement. Generally, there are two types of MU or EHR programs. While one is the Medicare EHR Incentive Program, the other is Medicaid EHR Incentive Program. Both the programs have similarity with each other though there are certain differences as well. These incentive medical programs are specifically designed for supporting an increased adoption as well a use of EHRs. The ultimate objective of these programs is to improve the outcome of patient health care systems. Such has been the progress of these programs that more and more healthcare clinics are vying to adopt them. However, the healthcare service providers need to attain a certain extent of eligibility before they can implement the programs. Of late, the Meaningful Use Program is making substantial progress, both in terms of proper participation as well as meeting their objectives. So much has been the progress of the program that over 93 percent of the eligible health care service providers, while 82 percent of the eligible health care professionals are now registered to conduct the program. Meanwhile, more than 334,081 providers have already received payments for successfully attesting and the rate of successful attestation is a whopping 99.9 percent and it is growing all the time. The objective of the program is met in more than 50 percent of occasions, while the actual average threshold has been to the tune of 90 percent. Riding high on the successful implementation of the MU program and its rate of success, new hospitals are constantly joining the ranks of those who have effectively achieved the objectives through use of the program each month along with reaching the important program milestones. As per the recent statistics, by the end of July 2013 about two third of the clinics as well as hospitals have successfully achieved the first stage of “Meaningful Use” while another 16 percent of the clinics have received mecicaid incentive payments to adopt the certified HRT technology. Taking into account the stakes along with the fast changing healthcare scenarios this can well be said that the Meaningful Use programs have made substantial progress. Here is a brief account of the progress made by the program. Amongst the 17 percent of the clinics or hospitals, that have still not qualified for incentive payment, over 50 percent have either opted to register for Medicare and Medicaid EHR incentive curriculum or have enrolled in the Regional Extension Center (REC). This clearly shows their awareness for the incentive programs. Besides, it is also an indication that they are slowly but steadily working towards adopting the Meaningful Use. Till date, the small rural hospitals have shown the highest MU achievement rates. As per the statistics, 76 per cent of the small rural hospitals, 72 percent of the medium scale hospitals, while 77 percent of the large scale hospitals have implemented and successfully adopted the program. Comparatively, rates have been found to be slightly on the lower side, when it comes to Critical Access Hospitals and the small urban clinics and hospitals. 61 and 56 percent of them respectively, have so far adopted the program. Touch base with a healthcare software development firm to develop medical practice management system. We provide healthcare software development services. All of our healthcare developers have cleared industry certifications. If you would like to hire healthcare software developers from us, we would be glad to assist you at Mindfire Solutions. This Post was posted in Health Care and tagged Clinical software development, develop clinical information management systems, Develop Electronic Health Records, Develop medical practice management system, develop physician cpoe systems, healthcare software development, healthcare software maintenance, hire healthcare software developers, iphone healthcare app development, Medical Software development. Bookmark the permalink.